Kristine Poggioli, co-author (with Carolyn Eidson) of Walking San Francisco’s 49 Mile Scenic Drive is on The Soul of California podcast today talking about urban hiking for health and pleasure, SF history and landmarks and more. Walking San Francisco’s 49 Mile Scenic Drive is a unique guidebook that shows walking — rather than driving — San Francisco’s famous scenic route gives both tourists and natives an active, fun way to enjoy and fall in love with the most beautiful city in the world. Walking San Francisco’s 49 Mile Scenic Drive invites readers to explore quirky locales face-to-face, so they can fully savor the City’s beauty and cultural riches — while also enjoying a healthy urban hike. 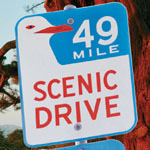 Written by two long-time San Franciscans who have explored every nook and cranny of the 49 Mile Drive, Walking San Francisco’s 49 Mile Scenic Drive presents 17 bite-size walks, complete with turn-by-turn instructions, maps, and historical facts and information. Each chapter introduces the sights, landmarks and secret treasures of a specific San Francisco neighborhood, while leading the reader along a route that will provide healthy exercise for both brisk and sedate walkers. Each chapter includes detailed maps, points of interest, info on bus routes and parking, recommendations for visiting hidden gems and must-see museums, plus plenty of tips and stats to help walkers, such as step counts and mile distances, hill steepness rating, weather tips and more. The perfect guidebook for today’s urban enthusiast who values walkable neighborhoods, hyperlocal culture and the pleasure and health benefits of walking, Walking San Francisco’s 49 Mile Scenic Drive is the most intimate way to explore America’s most beautiful city. Get your copy of Walking San Francisco’s 49 Mile Scenic Drive here!